September 17, 2014, Princeton, NJ- KOAMTAC, Inc. today announced the release of its new KDC30 model, an advanced miniature Bluetooth barcode scanner. Equipped with a Code imager, the KDC30/30i provide a cost-effective 1D and 2D barcode scanning solution for smartphone and tablet applications. KOAMTAC, Inc. and Code are confident the design of this product will be a great success in all solutions, particularly in retail and healthcare environments. Measuring a scant 38mm wide by 84mm long and 18mm thin, the Bluetooth scanner offers more than 10,000 scans per charge. This highly configurable device includes four buttons: scan, up, down (for controlling Bluetooth connections and remotely activating soft keyboards), and a delete key. Custom features are available, including a vibrating option and backup battery for the real time clock. 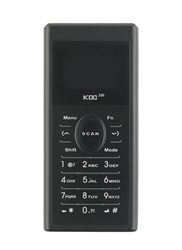 For offline data capture, the KDC30 has ample memory capable of holding up to 10,000 barcodes. The KDC30 is now available through the company’s worldwide distribution channels or at www.koamtacstore.com with a starting MSRP of $449 (USD). KOAMTAC, Inc. Headquarters is based in Princeton, New Jersey and produces a signature line of lightweight, ergonomically-friendly Bluetooth barcode scanners. The company is also dedicated to environmental conservatism, while maintaining the quality expectations of its consumers. With its unique patent design, all scanners reduce the company’s carbon footprint and provide consumers with a durable and enhanced solution. All products are universally compatible across current technology platforms, and offer seamless use with iPhone/iPod touch/iPad, Android, Blackberry, Mac and Windows-based devices. The KDC20, KDC30, KDC100, KDC200, KDC250, KDC300 and KDC350 are the world’s smallest and lightest programmable barcode data and card readers with a display on the market today. The KDC400-Series are patent-protected modular sled accessories for single-handed utility. For additional information or to place an order, visithttp://www.koamtac.com. Code is a technology leader in the design, development and manufacture of the latest generation of image based barcode readers. Using advanced high-definition and multi-resolution optics, coupled with cabled and wireless communication options, including Bluetooth®, our product suite is ergonomically designed to expedite data collection tasks and enhance productivity for the mobile worker. The Code product line is used in mission critical applications within healthcare, public safety, technology manufacturing, transportation, retail and a range of other diverse industries. Code provides reading and decoding of all open barcode symbologies. In addition, Code also offers its proprietary GoCode® symbology for secured data applications. Code’s worldwide headquarters are located in Salt Lake City, USA, and has regional headquarters in China, Singapore and The Netherlands. For more information, go to www.codecorp.com.